For ID-12 and ID-20 RFID sensors, it would be nice to have some kind of mounting board. connections between pins, and also provides the needed place for resistors and capacitor. with 3,3 V systems like Raspberry Pi and the GCA-PI01 HAT. The numbers with connections correspondend with the numbering on GCA_PI01 S1 connector. Remind that only pin 1,2 and 4 are to be connected to GCA_PI01, do NOT connected pin 3 in this case. ID-12 and ID-20 also provide INVERSE(3)(=connection to any Processor) and NOT INVERSE(4)(= connection to RS232 port) outputs. Follow directions below in case you have some doubts. 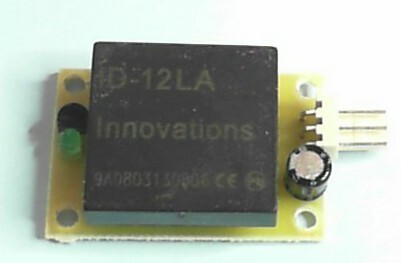 a small filter (R1 and C1) is used in the power supply. 3 Non Inverse output (R3 installed) remove R2 and R6 This option is for direct connection to Serial Port. Pin 1 Pin 2 GND Please note pin reversal ! Pin 2 Pin 1 +5V Please note pin reversal !